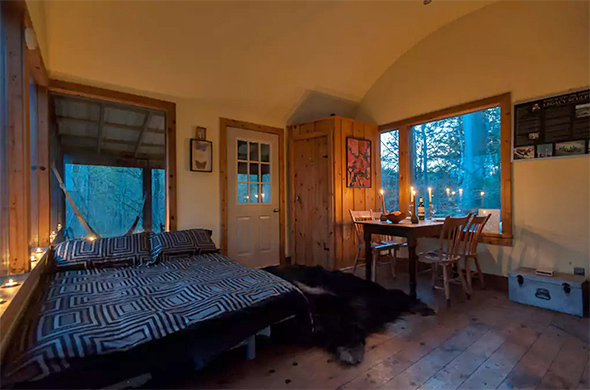 Romantic getaways near Toronto are the perfect way to ditch the city for some much needed rest and relaxation with your significant other. 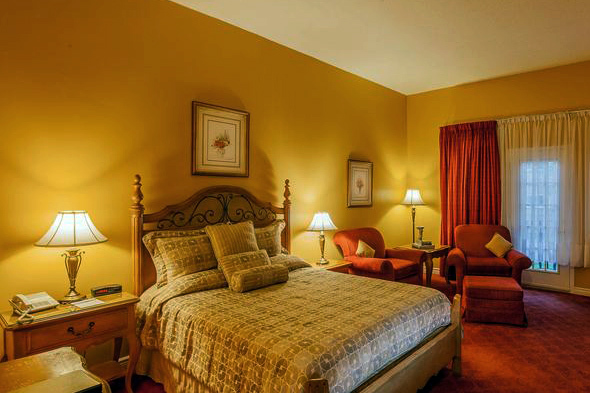 There are a host of gorgeous inns and secluded spots within a short drive of the city where you can dial the romance up, all while getting cozy by a fire, luxuriating in spa services, or just soaking up the atmosphere of small town Ontario. Here are my picks for the most romantic getaways near Toronto. The Drake Devonshire brings the vibe of the Drake Hotel to the County with dramatic results. You can do wine tastings by day before settling in for dinner in the stunning lakeside restaurant. Other options include a charmingly revamped motel, an old carriage house or a heritage home. The Millcroft Inn can be like a winter oasis. Photo courtesy of Vintage Inns. 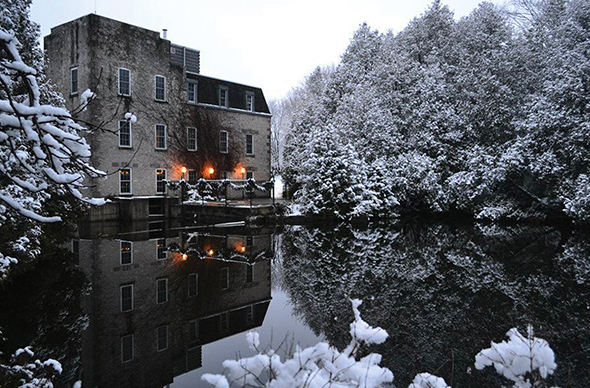 Located just a short drive from Toronto, Caledon's stunning Millcroft Inn is nestled right beside Shaw's Creek in a former textile mill. The town is artsy while the inn itself is memorable for its unique setting within the creek, its cozy rooms, and spa services. The beautiful lobby at the Pillar and Post. Photo courtesy of Vintage Inns. There are a number of old hotels in this scenic town, all of which offer romance-ripe rooms surrounded by wineries. Harbour House and the Prince of Wales are excellent, but I'm partial to the Pillar and Post for the rustic charm of its lobby, its warm restaurant, and indoor pool. Few things are more romantic than a secluded treehouse cabin. Photo via Airbnb. If it's seclusion that you're after, there's nothing better than an isolated tree-house style cabin. This cabin-loft near Port Perry looks out on 300 acres of land, while this nearby treehouse really is nestled in the forest. There's also an array of cozy cabins to rent outside the city. You can step back in time at the Woodlawn Inn. 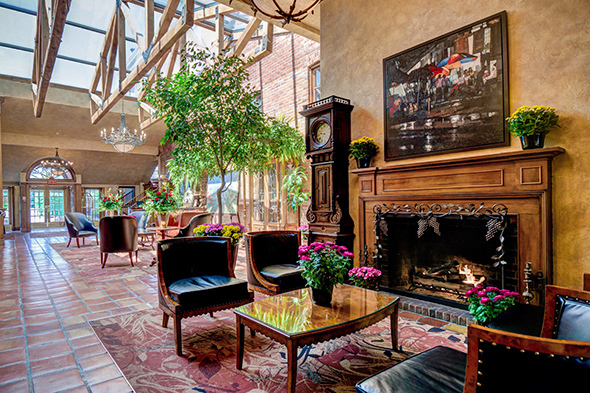 The Woodlawn Inn is a stately old hotel dating back to the 19th century. It's a bit more reasonable price-wise than inns to the west of Toronto (rooms start at $99), but it's still outfitted with charming decor and boasts the best dining experience in the town. The Galt area of Cambridge is one of the prettiest small towns in Ontario. Photo by Christine Smeath. Most of us lack the time and money to run away to Europe for a week when we want to spend some quality time with our partners. Instead, travel back in time in the Galt section of Cambridge. For a special occasion, stay at Langdon Hall and head into town during the day. One of the nine course on Mount Julian's epic tasting menu. Sometimes the most romantic getaways are those with the best food. You can dine on a locally-inspired tasting menu in a cozy 19th century inn at Viamede Resort's beautiful Mount Julian restaurant while enjoying the calming vista of Stoney Lake. Instant relaxation. Drake Devonshire. With contributions from Derek Flack.